Since 1999, the small town of Sturminster Newton has held a cheese festival. 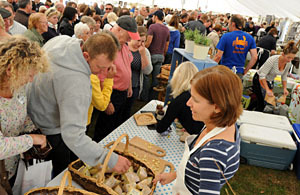 Thousands are attracted to the annual foodie weekend which has grown ever bigger and better. It is run as a charitable event and held in the second weekend in September. Plenty of Dorset cheese makers can be found there, but also those from neighbouring counties and further afield. It’s not all about the cheese though. Other food producers come to the festival with meats, condiments and more – there are over 60 traditional food stalls to work your way around. To wash it all down, the festival also has real ale and cider tents. Two large tents hold the food producers which can get very busy – plenty of free samples are available to try, from Dorset Blue Vinny to feta. Outside of the main tents are plants stalls, an entertainment area for live music and a good mix of other stands to keep you entertained including Punch and Judy and the local Dorset fire brigade. Of course there are also cheese-related activities such as cookery demonstrations to inspire you to use your cheese in new ways. For cheese lovers, it’s a must. A free park and ride operates to the festival from the outskirts of Sturminster Newton.